Gisele Bündchen and Bridget Moynahan were once both insanely talented models. Both women made it onto the covers of major magazines — from Glamour to Allure to Vogue. But that’s not all these two women had in common. Both Bündchen and Moynahan got involved with the same man: New England Patriots’ quarterback Tom Brady. The four-time Super Bowl MVP also went on to father children with both women — but we’ll tell you more about that later. While we all know how this love story played out in the end (Brady and Bündchen: happily ever after), the middle was messy. Exes are never really known to get along all that swimmingly, but this trio’s situation was exceptionally tense — especially between Bündchen and Moynahan. Despite always being in the public eye, both women kept relatively mum about each other — that is, until they didn’t. Here is the untold truth about Bündchen and Moynahan’s complicated history and relationship. Did Bundchen go after Brady before he was single? In 2005, while at a New England Patriots game at the team’s home stadium in Massachusetts, Bündchen was shown a photo of Tom Brady who was, and still is as of this writing, the NFL team’s quarterback. Upon seeing what he looked like, the model, who was just coming out of a relationship with actor Leonardo DiCaprio, thought he was “definitely not too shabby.” She further revealed what she thought of the football star when speaking to the Boston Herald (via ABC News), saying, “He’s cute, but if he has a girlfriend, he’s gay to me.” Brady did indeed have a girlfriend — and a serious one at that. At that point in time, Brady and Moynahan had been dating for over two years. 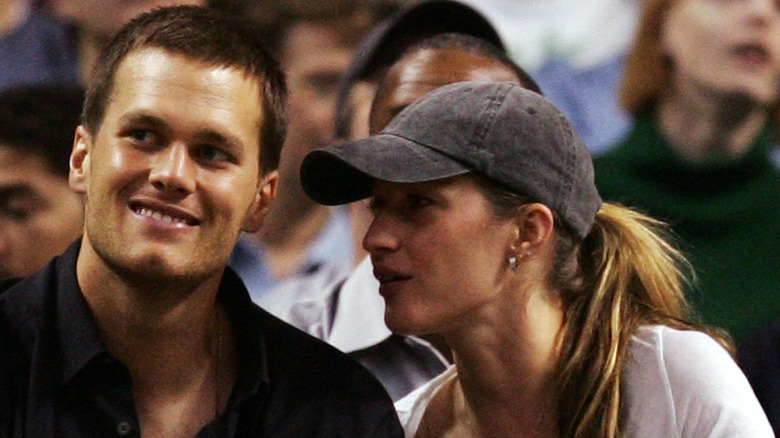 Was Bündchen making a play for Brady by telling the Boston Herald she found him attractive? She has refuted that idea, but one thing is for sure: by the later part of 2006, Brady and Moynahan split up and Brady and Bündchen got together. Brady would end up staying with Moynahan for a total of three years and, once they called it off, he didn’t waste any time being single. Almost immediately, Brady and Bündchen became a thing. Then, just two and a half months into their relationship, the couple received some shocking news. Moynahan announced that she was expecting a baby — Brady’s baby — and she had made the decision to raise the baby on her own. “In the beginning you’re living this romantic fantasy; you’re thinking, This can’t be true, it’s so good! And then, Whoops — wake-up call!” Bündchen told Vanity Fair. The new couple’s romance was certainly turning out to be less like a fairytale and more like an episode of The Maury Show. Finding out your new boyfriend’s ex-girlfriend is pregnant with his child is a wild scenario, to be sure, and one that’s hard to even imagine happening — outside of your favorite soap opera, of course. Bündchen told Vanity Fair that she initially considered encouraging Brady to get back together with Moynahan. “You question at times — ‘Should I stay here? Maybe you should work this out,'” she explained to the publication. In the end, Bündchen stuck by her man, reasoning that people don’t just break up without a good reason. Although Moynahan didn’t comment on how this situation made her feel toward Brady, it’s likely she had some pretty different feelings. Pic! Is Nick Jonas Dating a Victoria’s Secret Model?